these scenes may also have the aim of presenting the succession of the seasons and thus providing a calendar for eternity. The upper area is divided into three registers, the top two of which have a canopy at the right-hand end, under which sits another image of Nakht. 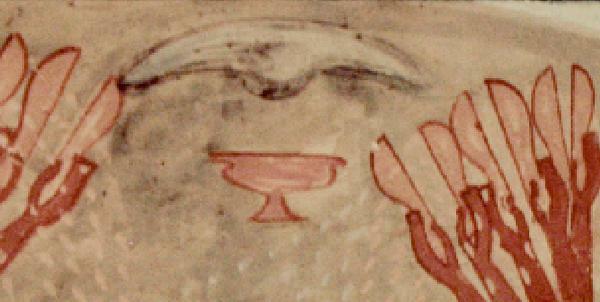 He also appears similarly at the right-hand end of the bottom register, again under his canopy. None of the actual scenes of agriculture contain descriptive texts, although thirteen columns for such were created in the next to top register; these were however left totally blank The activities begin in the bottom register with the preparation of the land and continue in the three shorter upper ones. The upper image of Nakht has him seated on a stool, holding a long staff in his right hand and a folded piece of cloth in his other, which he rests on his lap .He is dressed differently to that of his standing image before the offerings, this time he has a semi-transparent garment over his upper torso, which drapes over his back. This canopy, and the one below, is supported at the front by a papyriform pillar, with a double lotus blossom attachment, and the remainder of the structure apparently made from reed mats, including the ground area on which his stool rests. 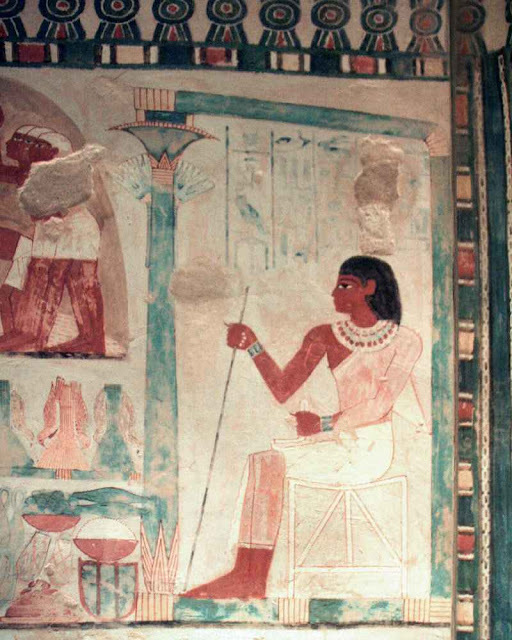 This upper image, which is larger than the one below, includes five columns of descriptive text, written in blue hieroglyphs, in which the third column (containing the name of Amon) has been destroyed. 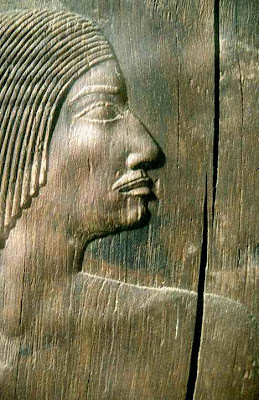 The text states: "Sitting in a booth and looking at his fields; the serving-priest of [Amon, the scribe Nakht, justified], triumphant before the great god." . 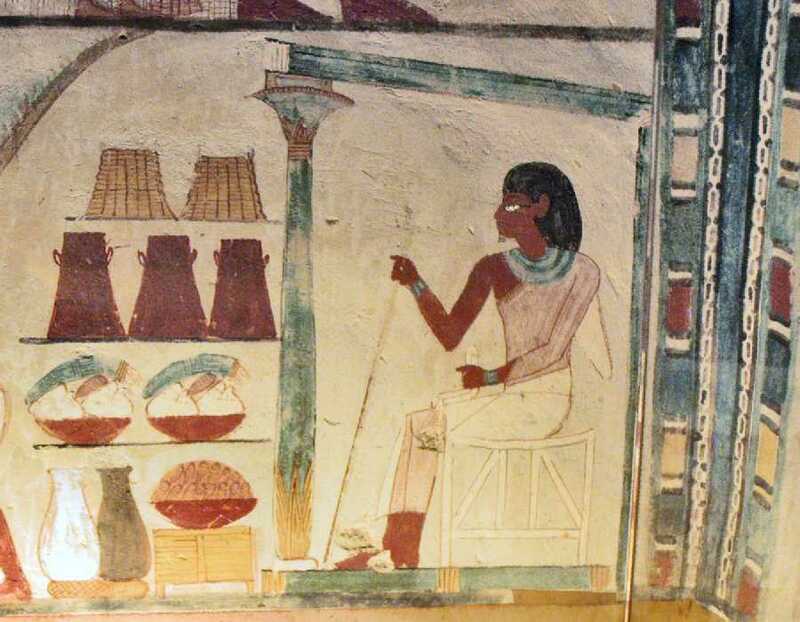 In front of his booth are piled many provisions of food and drink, this time not being offerings but his sustenance during his time observing the activities in the fields, which he observes. the workers of this bottom register are also supplied with provisions. These are located at the left-hand end of the scene, under a tree, obviously less plentiful than those of their master. In the branches of the tree hangs an animal skin of water, from which one of the workers drinks. For some reason the artist has included one bag of corn seed on top of the workers' provisions and two on top of those of Nakht. Several scenes are depicted here, one set separated from the other by an undulating ground level or a creek, which runs along the middle of the image, in the centre of which is enclosed a small lake or pool left by the inundation from the Nile. This certainly gives the imagery a feeling of depth. The major activity (by size) is that of ploughing, where the two farmers direct their ploughs towards each other, thus forming at first glance a symmetrical composition. However, these two images are different. On the left, the farmer stands erect and reasonably youthful, his plough being pulled by two brown oxen. 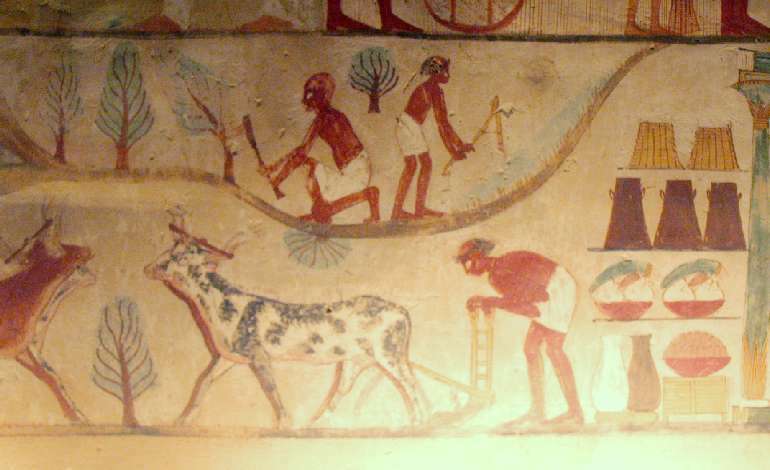 Whereas, the farmer on the right is bent over his plough and with his partially bold head is obviously much older; his plough is pulled by two black and white oxen. Behind the left-hand ploughman is a naked youth who scatters the seed into the furrows he has made. Above the undulating separation are two more scenes. When the Nile flood has receded (in late summer), it leaves behind large pools of water, as shown in the undulating line, in the low-lying agricultural land. This area also remains muddy and is where Egyptian peasants sowed their crops. 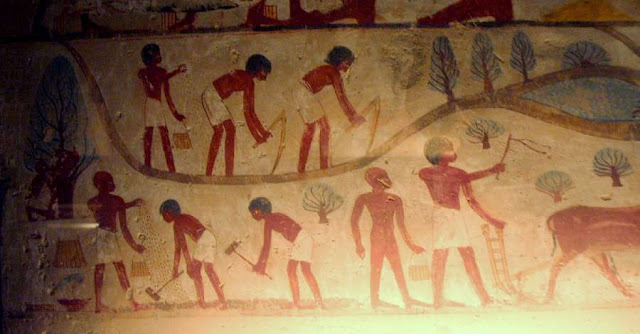 The farmers on the left are shown standing up to their ankles in the mud, using hoes to break up the more solid layer below. 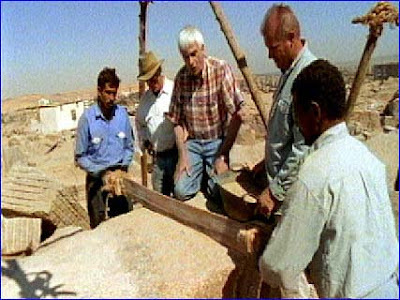 A seed sower works with them. On the right, a field worker cuts down tamarisk and mimosa trees at the edge of the cultivation area, thus extending the fields farther towards the desert. Another man works in the wild grassland thus enabling its cultivation. This is divided into three sub-scenes, starting from the right. 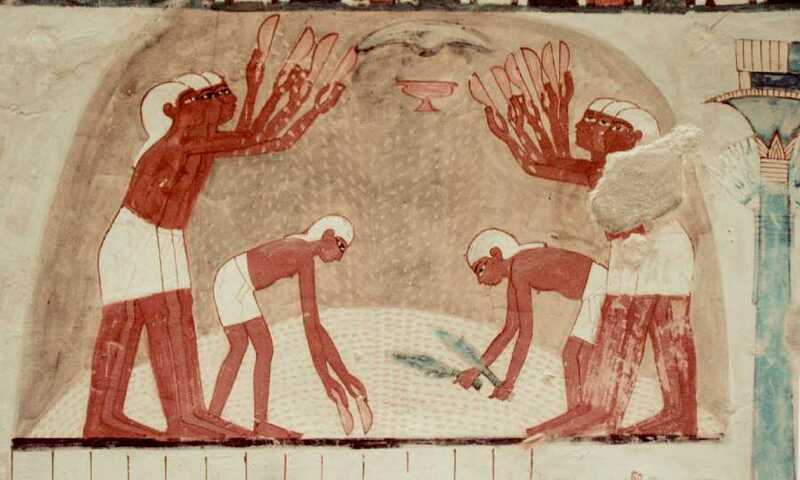 Three harvesters, each holding a sickle, walk into the tall wheat in order to harvest it. They all point in front of them, perhaps towards Nakht who may be overseeing what they do, or perhaps pointing to what still had to be done. The artist has omitted to add the detail of the tall stems of the harvest in front of them, which is included behind them, but did manage to make it a straw colour. The tall crop of the first scene separates this scene from the one to its left. Here, two workers are trying to close the top of an overfilled container, indicating the abundance of the harvest. The man on the left stands in the usual attitude, whereas his companion is shown in full action, as he leaps into the air to put pressure on a long pole, to try to force the excess into the large basket. Below him is a gleaner gathering the heads of wheat which have fallen to the ground. 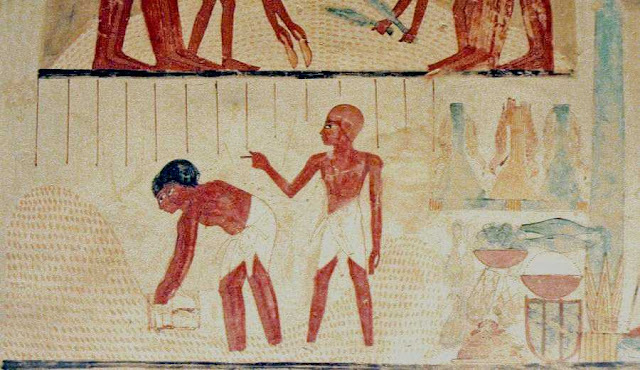 At the left edge, two girls harvest flax, which also appears in other tombs, although there seems to be no real connection with the crop being harvested, other than perhaps the time during which it happens. The colour of the background plants is totally different, changing from a straw colour to green, which definitely separates the two scenes within the register. It also highlights the whiteness of the dresses of the two young ladies, thus easily seeing that they wear dresses of different designs, although both are fairly close fitting and reach down to their ankles. Due to a lack of space, the artist has omitted the treading of the corn on the threshing floor by oxen. Thus the action moves immediately from the harvesting to the topmost scene, that of the winnowing. The winnowing scene is that of the separation of grain from the chaff, which would have taken place on a day when a light breeze was blowing. This would blow away the light chaff, letting the grain fall to the ground. Six men, three on either side, toss the mixture into the air using two scoops, whilst two others stoop in the middle. One picks up more of the mixture from the ground, again with two scoops, whilst the other is provided with two small brooms and brushes the scattered grain towards the central heap. All the men wear white cloths tied around their heads to keep out the dust. The image is very symmetrical, using curves within curves. 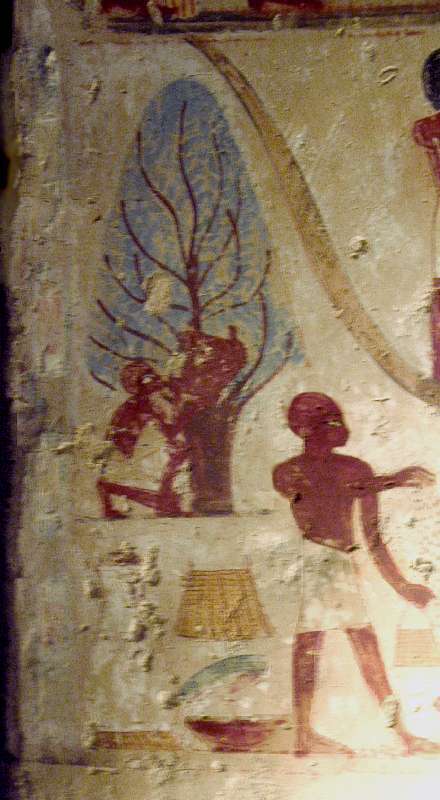 Above the scoops of the standing men is an image which also appears in TT38. This is a goblet stand, above which can be seen the presence of a strange object resembling ectoplasm : it actually consists of a bundled sheaf of corn held within a crescent moon shape. This was thought by Davies to represent an inverted goblet, and that the group evoked an offering to the goddess of the harvests, Renutet. According to Moret and Assman, it is to be considered as representing an offering to Osiris, but an explanation proposed by Capart seems more probable: "Miss Blackman (note: this is the sister of the well known Egyptologist) […] had the surprise to discover, suspended in a granary in Illahun, the object which appeared in the tombs of the XVIIIth Dynasty. It is a kind of small doll made from the last collected ears, and which was keep until the following season". Nice blog. The tomb of nakht has been described so well. I love the way you have explained and mentioned about nakht. I love to read blogs regarding agriculture base. 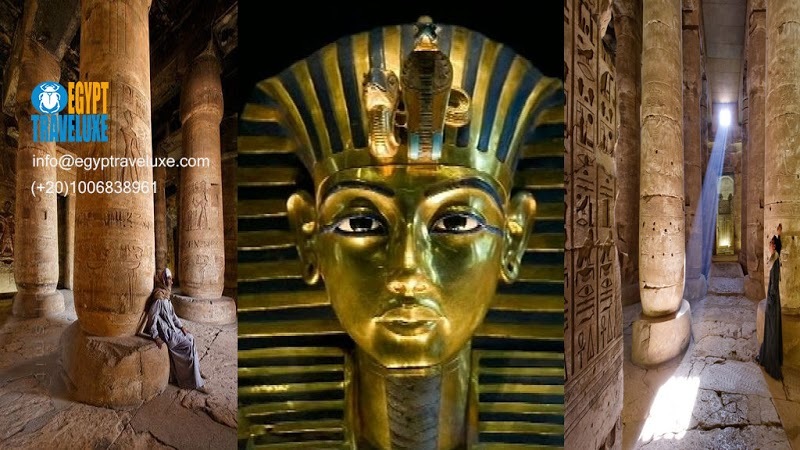 A few months ago I visited Egypt country by taking help from Imperialegypt.com.for my Egypt trip. The agency suggested me to visit a place in Egypt which consists of such nakht scenario. From that only I came to know about the tomb of nakht.